We looked at pictures of the artist Mark Rothko. We discussed how he often named his pictures after the colors he used. We examined his use of color and how he created his "color field" paintings. 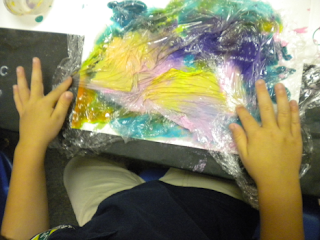 We used our fingers to blend the different colors. We observed how colors appeared and disappeared. 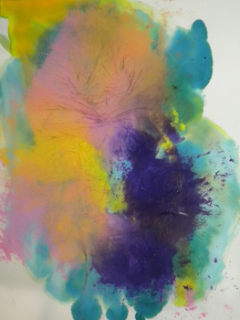 We purposely moved our fingers to isolate certain colors. 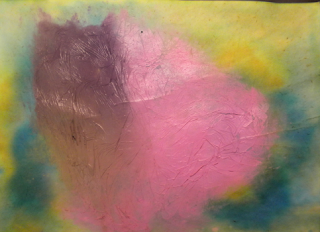 Yellow, purple, blue and pink. the colors are brilliant and their hands are clean! !What medium are you using? what was the reaction of the kids? love these - can you tell us if this is bottled tempera, and what type of paper you use? Thanks! 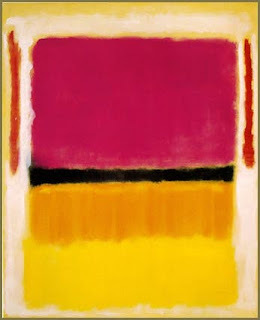 I love Mark Rothko and I bet the kids did too. Looks like a lot of colorful fun. I'm so impressed with the little slideshow in your side bar. How'd ya do it? For the colors we used liquid water colors (Colorations, from the Discount school supply). 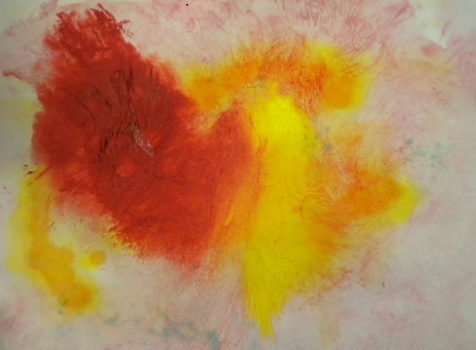 The students mixed bottle tempera and liquid water colors. 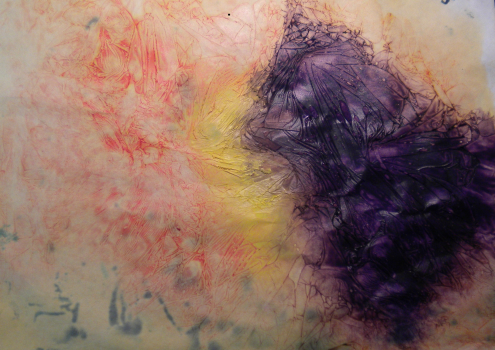 We left the plastic wrap on the paper for couple of days, ( heavy construction paper) but you will have better results with water color paper, and when we removed the plastic wrap, the mixing of the colors and the texture was revealed. 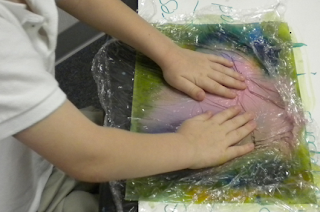 The kids had fun trying to isolate the different colors by manipulating the plastic wrap. And the hands remained clean! As for the little slideshow, I am thankful for my daughter because she helped me create it. We did in in Picassa. Thanks Marilena. 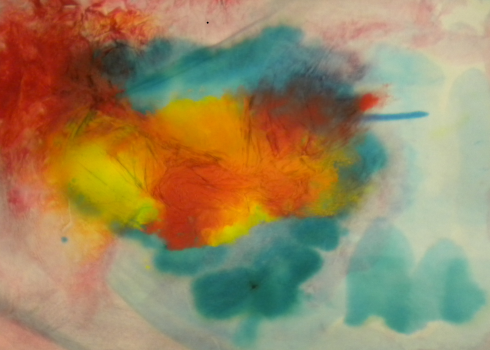 I never would have thought of mixing tempera with liquid water colors. Much easier to manage than finger painting, too. I really want to try the slideshow, too. 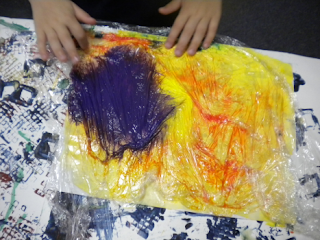 I love what you are doing with the children, the colours they used are brilliant and the plastic wrap idea is really good.